While they last, these copies are signed by the illustrator! This is a wonderful book with terrific illustrations. Kids know what's right and what's wrong. One of the hardest things for a child to do, when confronted by bullying or other forms of injustice, is to simply say something. 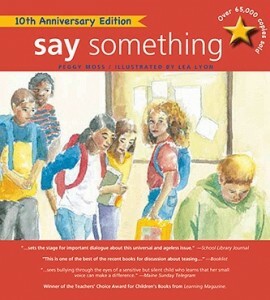 This book will help children find their voices. While supplies last, copies of this book are signed by the illustrator, Lea Lyon. Lea Lyon now juggles her work in the business world with her love of painting, takes numerous painting and drawing classes, and even meets with a group of five women every week to paint and talk about their work. Her illustration portfolio has won awards twice at the Society of Children's Book Writers and Illustrators conferences. This is her first children's trade book. Lea lives in Richmond, California.